On The Amazing Race Season 30 Episode 9, eleven teams from past seasons return to compete for the $1 million prize as the 31st season begins. "It's Just a Million Dollars, No Pressure"
On The Amazing Race Season 30 Episode 8, the competitors make their way through Hong Kong and then San Francisco as the race comes to an end. "The First Rule of Amazing Race Club (Bahrain and Chiang Mai, Thailand)"
On The Amazing Race Season 30 Episode 7, scorpions are on the menu in Chiang Mai, Thailand, and one team's game is threatened when they misplace a passport. "All's Fair in Love and War "
On The Amazing Race Season 30 Episode 6, racers swap teammates for the entire leg and encounter a double U-turn while competing in Zimbabwe. On The Amazing Race Season 30 Episode 5, the teams face a double U-turn and struggle to navigate the streets while delivering kegs to a local party in Prague. "Gotta Put Your Sole Into It"
On The Amazing Race Season 30 Episode 4, at a Road Block racers must sail a small dingy to two buoys, each marked with half of the next clue. "It's Gonna Be A Fragrant Day"
On The Amazing Race Season 30 Episode 3, in Morocco contestants must go through bins of fish at the Old Fish Port and arrange them properly to get ahead. "You're the Best French Fry Ever"
On The Amazing Race Season 30 Episode 2, fthe first time ever, teams square off head-to-head in a competition to earn their place and avoid elimination. 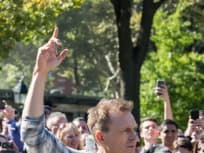 "You're a Champion, Prove It"
On The Amazing Race Season 29 Episode 13, Phil Keoghan starts the race in iconic Washington Square Park in New York City to welcome 11 new teams. 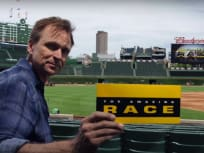 "We're Going to Victory Lane"
On The Amazing Race Season 29 Episode 12, the final three teams race to Chicago where they perform challenges at Wrigley Field as they dash to the finish line.